Oxygen is essential for the development of aerobic bacteria. That is why Agrona developed the Oxybull aeration system. It is a kind of vibratory plate that pumps air through a special membrane fabric and thus introduces millions of miniscule bubbles in the water basin or silo. 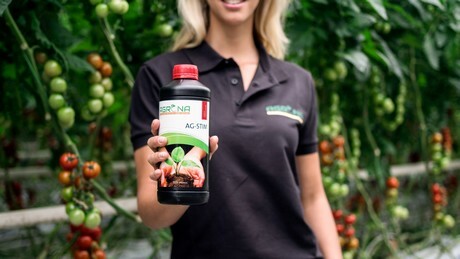 The increased oxygen level – measurable down to the substrate slab – also ensures better plant health, in addition to the favorable growth conditions for the bacteria. “A better root system develops, more growth and higher productions,” according to Nadir. “And you need less chemicals.” The company supplies the device in combination with their organic fertilizer AG Stim line. Agrona has developed the ABR system especially for the production of bacteria: a nursery for aerobic bacteria. The bioreactor consists of a tank filled with a membrane and with water and a connected compressor. Bacteria have a large adhesion surface, thanks to the membrane in the tank. The linked compressor provides the aeration of the water. “In combination with the nutrients, conditions arise for optimal multiplication”, Nadir shows. By vibrating the membrane, the bacteria are released in a controlled manner and thus, together with the aerated water, are released into the irrigation system.